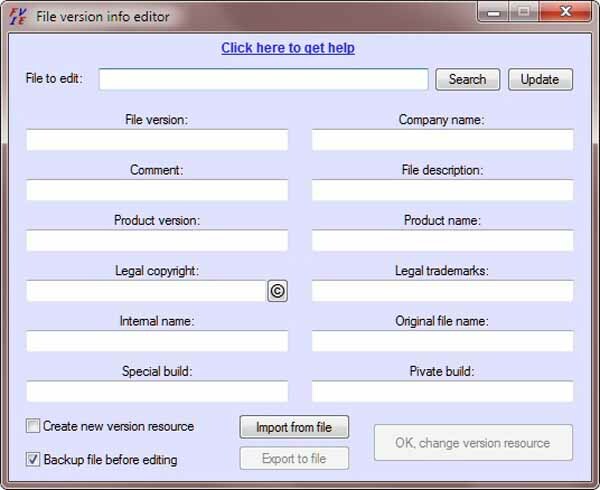 Free download File version info editor Latest Version.It’s highly recommended to backup the files before editing them. Some files may become unusable after the edition, specially the files compiled using UPX. The backup will only be done once. If a file has already been backed up, no second backup will be created. This allows you to always have the original file saved. When you launch FVIE, you will note that the Export to file and OK, change version resource buttons are grayed by default. This is because no file is loaded.Click the Search button, browse to the file you want to edit and click Open.You can also drag and drop a file in the File to edit input box.you click the Update button, the information already contained on the file version resource of the file will be loaded to corresponding fields. After filling all the desired fields, you may be interested in saving the information to a ini file so you won’t have to write everything again. Click the Export to file button and choose the path and name of the ini file that will hold the data.